Aitigar Mosque, located in the heart of Kashi, is the largest mosque in Xinjiang as well as the best institute of learning of Islam in Xinjiang. It occupies an area of 16,800 square meters, and consists of the halls for worshiping, the halls for scripture reciting, the gate tower, and the institute of learning. 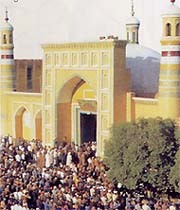 The worshiping halls and the square in front of the mosque are large enough to accommodate 100,000 worshipers at one time.